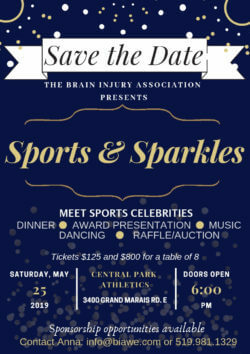 We would like to introduce to you our new signature event, Sports & Sparkle The Main Event. 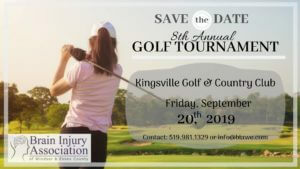 Dedicated volunteers have been planning this one of a kind event since early 2013 and the anticipation builds as we work toward a common goal to raise awareness and funds for brain injury services and programs in Windsor and Essex County. We are a charity and our funds stay local. We want to continue to have a large impact in our community and we want to reach business people like you. We would love to have your company on board to support a great cause. 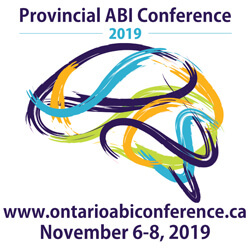 The BIAWE is a charitable organization committed to enhance the lives of residents of Windsor and Essex County affected by acquired brain injury through education, awareness, and support. The proceeds from the gala event will go directly to support BIAWE, which is funded by families, survivors and local sponsors. Your contribution can support our growing needs. Biz X magazine is Windsor & Essex County’s favourite business and people publication. Biz X magazine has been publishing 10 issues a year since 1998…and it is THE publication reaching the working people, which includes business owners/managers! Each edition is distributed (10,000 copies, one per business) to registered businesses through Canada Post. It’s this reliable distribution method that ensures the magazines are being received AND READ… and delivery to the businesses ensures each ad has a long shelf life as issues can remain in lobbies and break rooms for months, sometimes years…also 3,000 promotional copies are distributed all across Windsor/Essex, plus select locations in Chatham, Tilbury and Sarnia – at NO EXTRA CHARGE. ALL OUR MAGAZINES IN FREE DISTRIBUTION POINTS ARE PICKED UP AS WELL (as everyone wants to grab a copy to know what is going on in Windsor/Essex!). Please visit www.bizxmagazine.com to see the complete list of locations. Plus, we’re the ONLY international border city publication in our region! An additional 3,000 copies are distributed to 450 pick-up locations in metro Detroit. But, Biz X is not just print and digital…the magazine is everywhere reporting events and news of interest to our readers! COMMUNITY PRESENCE and consistent distribution over the years has helped Biz X become a trusted advertising source. As well as hosting a very popular and publicized annual business awards program and gala, and highly promoted monthly networking events at different venues, the magazine also sponsors and covers community events with pre-promo, attendance and post promo photos! Biz X is everywhere you need to be!